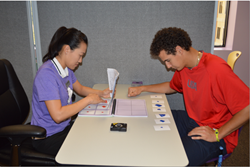 LearningRx trainer and pro-golfer, Ki-Shui Liao, worked with Austin Bergner, training the cognitive skills Austin uses both in school and on the field. LearningRx training session with trainer Ki-Shui Liao (left) and Austin Bergner (right). All eyes, including those of MLB scouts, will be on Windermere Preparatory School senior, baseball gold medalist and LearningRx Orlando student, Austin Bergner, as he pitches the first game of the season at the school’s baseball stadium Friday, February 19 at 4 p.m. At the core of Bergner’s outstanding baseball performance is his commitment, exceptional athletic abilities and dedication to cognitive training, facilitated through LearningRx brain trainer and female pro-golfer, Ki-Shui Liao. Bergner and his parents chose to enroll him in over 60 hours of cognitive training at LearningRx. LearningRx’s team of brain trainers work one-on-one with clients of all ages, doing fun and challenging mental exercises that work on the brain’s core cognitive abilities. These cognitive abilities are the skills the brain uses every day to think, read, learn, remember and pay attention – activities that are critical in sports, in education, on the job and overall in life. Specific cognitive skills targeted by LearningRx training includes visual processing, attention, processing speed, logic and memory. Bergner boasts an impressive performance, from pitching in the 2015 Perfect Game All-American Classic to winning Gold with the USA Baseball 18U National Team in the 2015 Baseball World Cup. He has also been named number 14 in USA TODAY High School Sports’ “60 for ‘16” highlighting 60 high school athletes graduating in 2016 to keep an eye on through the remaining school year. While Bergner has committed to the University of North Carolina, he is expected to be a potential draft pick in the upcoming MLB draft in June, creating a lot of interest in him in the opening round. While many of the clients who come to LearningRx are struggling students, others – like Bergner – are not. The company serves children and adults of all ages. With great anticipation, LearningRx of Orlando will be in full attendance at Bergner’s first game on February 19 to cheer him on. For more information about LearningRx, visit http://www.learningrx.com/orlando-windermere/. LearningRx specializes in identifying and working on cognitive skill deficiencies. Cognitive weaknesses are often at the root of learning, memory or attention struggles. Pioneered by Dr. Ken Gibson and refined over a decade of research and testing, the program consists of cognitive skills assessments before training and after training, as well as intensive one-on-one training with certified trainers who customize programs to meet each student’s needs. Students completing the program often experience increased confidence, self-esteem and overall achievement.